Home Parker Community Technologies Electromechanical Group Electromechanical Knowledge Base What configurable I/O is available on the AC890? Digital Outputs 1 & 2 can be configured to function as Digital Input 8 and Digital Input 9 respectively. By default DIN 8 /DOUT 1 and DIN 9 /DOUT 2 are configured as a Digital Outputs. They can be set up as Digital Input 8 and Digital Input 9 using the software DSE. Using DSE, delete the connections going to DIG OUT 1, as shown. Also configure a Logic Reader as shown using Tag 482. Tag 482 is the hidden internal connection for Digital Input 8. Connect the Logic Reader output, to the block to turn off /on. In this case, it is connected to the Or gate. Digital Input 8 is located at terminal X15-08 on the 890 drive. 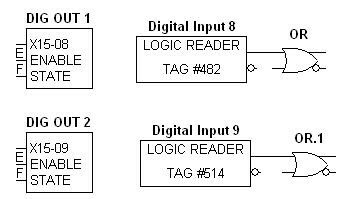 To configure DIN 9 /DOUT 2 as a Digital Input follow the above instructions but set the Logic Reader for Tag 514. Digital Input 9 is located at terminal X15-09 on the 890 drive. These Digital Inputs 8 & 9, operate the same as Digital Inputs 1-7. If 24vdc is applied to the appropriate hardware terminals, the Digital Inputs go True. These inputs are independent of each other. One can be an input and the other can be an output.